Full Spectrum CBD rich Hemp Pre-rolled CBD joints with the highest quality flowers selected for prefilling comes our amazing Goldline 3 pack. Each selected preroll is made from a high quality imported cone and filter to make for easy light-ups, even burns and smooth pulls. Our Gold Line Pre-rolls are available in 3 different strains; Indica, Highbrid, and Sativa for your smoking pleasure. No gimmicks, no herbal infusions, just straight high quality, high CBD flower for your smoking pleasure. 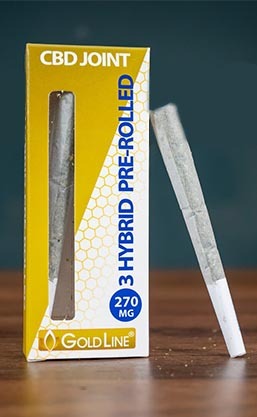 For those of you who enjoy the traditional intake method of Flower which is good old combustion, CBD Goldline has a Full Spectrum CBD preroll that delivers a very high CBD content in each preroll. No herbal extracts or eucalyptus, this is straight pure Oregon grown CBD flower that is 100% Legal to ship under the USA farm bill due to its lack of THC or any psychoactive components. Each CBD preroll uses a high-quality paper and filter and has twisted to the right tightness. Want options with your activation and intake you can choose your strain of course from a Hybrid, Indica, or Sativa to fit your taste. These are sold by the 3 pack and made to be the premier CBD traditional combustion smoke. Each one is smooth, flavorful, has powerful activation and has rich pine notes on the aroma and exhale.